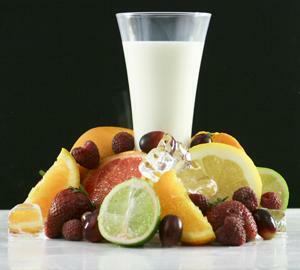 Many individuals would like a diet plan with whey protein to help them lose fat and gain muscle. Here are a few sample diet plans to get you started. Supplementing your diet with whey protein is a great way to add protein into your diet without consuming more high-calorie meats or cheeses. Vegetarians will particularly appreciate the flexibility of protein powder in a diet plan. This type of protein is a derivative of cheese production and is therefore a dairy product, which makes it an excellent source of lean protein. However, those with milk allergies will likely also have issues with whey. Vegetarians and others who choose not to consume meat products will find whey protein is an excellent way to still get in this important food group without compromising their dietary or ethical standards. Here are a few meal-by-meal ways to incorporate whey into your diet plan with whey protein. Consider the following tasty high-protein breakfast options. Mix in one scoop of vanilla whey protein powder into your oatmeal. This will add approximately 20 additional grams of protein to start off your day. Blend up a smoothie using one scoop of protein powder, one small banana, and one cup each of milk and ice. Add in one-half scoop of vanilla or chocolate protein powder into your morning coffee. Mix well for a creamy morning protein coffee. Incorporate a protein boost into your lunch today. Pair a mixed green salad with a fruity whey protein drink. Several companies, such as Isopure, make excellent and great tasting alternatives to the typical milky whey protein beverages. Stir in a scoop of plain powder into your yogurt for a delicious cool dessert. For a quick meal on the go, throw a whey protein bar and a piece of fruit in to your bag. This protein and carbohydrate combination will hold you through to your next meal and give you an added boost of 12 to 20 grams of protein, depending on the bar. Here are a few ideas on how to incorporate this lean protein into your evening meal. A popular smoothie alternative is the green vegetable known by many as a "green monster." Follow the breakfast smoothie recipe above, but add in one to two cups of dark leafy greens, such as spinach or kale. Add plain protein powder to warm soup. Note: It's not a good idea to add whey protein prior to cooking, as this may denature the proteins. Stir plain powder into your favorite pasta sauce, like Alfredo or spaghetti sauce, after cooking. It's important to know that one single scoop of protein powder generally contains about 20 grams of protein. It may not be necessary to add this to every meal. In fact, one scoop per day may be enough for some individuals. To find out how much protein you need per day, multiply your weight in pounds by .37. Factors such as amount of exercise and medical conditions may influence your protein intake needs. For more information about how much protein you should be consuming, consult a doctor or nutritionist.